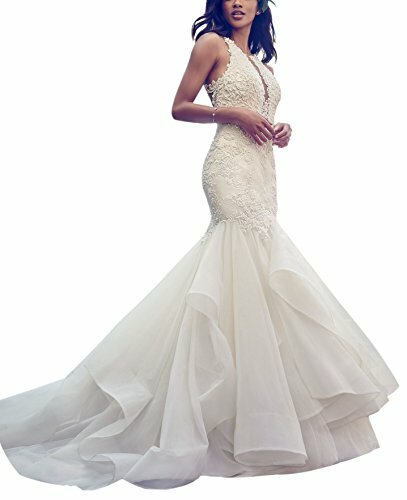 Charming New Fashion Sheath Trumpet High Neckline Sleeveless Lace Button Back Princess Wedding Dress for Bride 2018. >We carefully select high-quality beads, pearls, fabrics and threads to create every dress. We look for vibrant colors, beautiful sheen and rich textures in every material that goes into your dress. Our tailors do all ruching by hand to create the perfect shape and fullness on each dress. We strongly suggest you have your measurements taken by a professional before buying online. And welcome to contact us for help. Custom made process (from the date we receive your payment and measurements) will take about 2-3 weeks.The the delivery time is about 10 days. the total time is about 15 days. Please Confirm the Size Carefully,the Size Chart is on the Left;Do Not use the Size Infor Link. Trumpet High Neckline Sleeveless Button Back Long Sweep Train Empire Princess Wedding Dress for Bride. Elegant Tulle Pleated Long Trumpet Sweep Train,High Neckline Button Back,Bodice Built with Bra,Princess Romantic Wedding Dress Fall 2018. Custom Made Please Contact with Before You Placed the Order.